Student staff and members put money management principles into action. 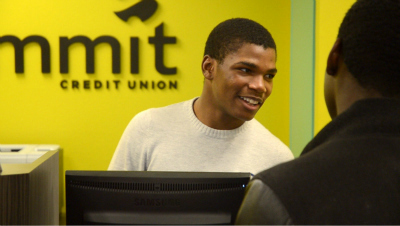 For two hours every day at Madison (Wis.) Memorial High School, financial education isn’t just an elective course—it’s a way of life inside the new Summit Credit Union branch. During lunchtime, students and staff stream into a cozy, brightly painted room adjacent to one of the main entrances at the school. There, they conduct basic transactions with student interns Darnell Richmond and Christina McFeely, whose classmates are saving for new phones, the upcoming prom, college, or simply because they know it’s a smart idea to set aside cash they’d otherwise piddle away. The fledgling operation, which started in January, is the second high school branch for $1.9 billion-asset Summit. More branches likely are forthcoming, following inquiries from other schools in the city, as well as outlying districts. Nationally, the credit union movement in recent years has expanded its efforts to provide teens on-site access to financial education and services, with high school branches in more than 30 states. That’s a point of pride during National Credit Union Youth Week, which runs through Friday. Reaching kids before they’ve developed bad habits or amassed debt is crucial, says Sarah Campagna, manager of the Memorial High School branch office. She and assistant Sam Annen drive to the school daily from a nearby Summit location to oversee the operation, open accounts, answer students’ questions—and promote the philosophical and financial benefits of credit unions and the cooperative structure. Student intern Darnell Richmond applies what he learned in personal finance class at Memorial High School in Madison, Wis. They also consult with business department head Sacia Wheeler and other staff about how best to serve a student body of more than 1,900 that spans the economic spectrum from poverty to great wealth. “When you’re talking about money management, it doesn’t matter whether you come from more money or less money—it’s about being able to manage what you have, and make good decisions,” says Dahmen, who has a business and marketing background. Campagna, a recent convert from the banking industry, marvels at Summit’s commitment to looking out for all its members by regularly offering seminars on various financial topics. She says the payoff is even greater among younger members, many of whom are entering their first relationship with a financial institution. 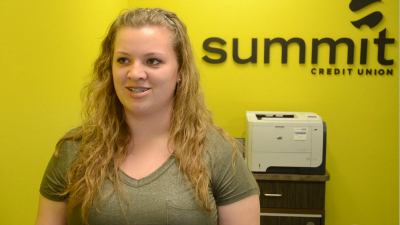 There are some notable differences between Summit’s student locations and its regular branches. To ease the responsibility placed on student interns, a smaller amount of money is kept in the cash box, currency comes in lower denominations, and services are limited to checking, savings, check cashing, and loans. Students must present a Social Security card to open an account, but can verify their identity with a student ID card or a printout of their data and photo from the school database. Minors can become members without a parent’s sign-off. Because teens embrace technology, Campagna enrolls new members in Summit’s online and mobile banking offerings, and walks them through the setup of those functions. She also spends extra time emphasizing the responsibilities of owning an ATM card. Christina McFeely plans to pursue a career in financial services. Many students wander into the branch out of curiosity. To entice more foot traffic, Summit hands out chocolate chip cookies on Fridays, enters new members in a sweepstakes for free prom tickets, and offers $10 referral bonuses to both new members and the existing members who convinced them to join. The internship program is a valued aspect of the operation. The positions serve as a bridge to students—interns draw friends and classmates to the branch, and Campagna taps them for the pulse of the student body and potential marketing initiatives—while also providing real-world job experience. Students must complete Memorial’s business curriculum to be considered for the semester-long internship, and recommendations of teachers weigh heavily.